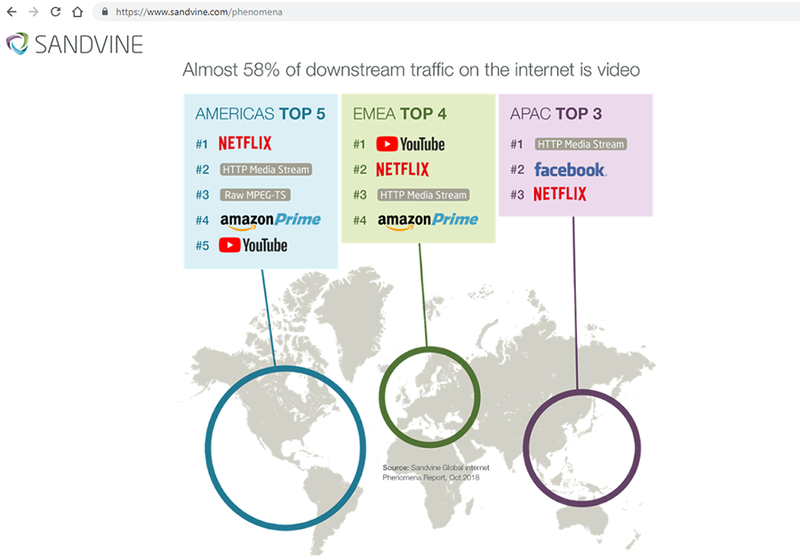 Netflix represents 15% of all downstream traffic across the entire Internet, according to Sandvine's newly released 1H 2018 Global Internet Phenomena Report. Sandvine's Global Internet Phenomena Report is based on the company's policy and traffic control solutions, which are deployed across over 150 Tier 1 and Tier 2 fixed, mobile, WiFi, and satellite networks serving a combined 2.1 billion subscribers worldwide. “Our business model is based on being ‘the best’ telco network data analytics company and providing our customers with use cases to understand, optimize, and manage subscriber quality of experience. Our goal with this report is to inform the global community on the ‘Internet Phenomena’ we live in every day, and to expose challenges and opportunities to build a more collaborative eco-system, improving the connected experiences for subscribers,” stated Lyn Cantor, President and CEO at Sandvine. Sandvine, headquartered in Waterloo, Ontario, was founded in 2001 by a team that had worked together on a previous start-up called PixStream, a video networking start-up that Cisco acquired that same year for C$554 million. Sandvine's core expertise is in network policy management, including the control of spam, usage-based billing, quality of service, and P2P throttling over any type of access network, including cable/DOCSIS, DSL/FTTx, Satellite, 3G, LTE, WiFi, and fixed wireless. Procera Networks, based in Fremont, California, was founded in 2002 and includes significant operations in Sweden. Its PacketLogic platforms use deep packet inspection (DPI) to deliver analytics, traffic management, and enforcement use cases for broadband network operators, mobile operators and academic institutions. In 2007, Procera completed an IPO and in 2013 bought Vineyard Networks, a Canadian DPI company, for C$28 million. In 2015, private funds managed by Francisco Partners Management, a technology-focused private equity firm, acquired Procera Networks in an all-cash transaction valued at approximately $240 million. The new company will serve over 400 communications service provider customers, with over 1 billion subscribers in more than 100 countries, as well as over 500 enterprise customers and more than 100 OEM and channel partners. It will be led by Procera's CEO Lyndon Cantor, and Procera CFO Richard Deggs. Epsilon, a privately-held global communications service provider based in London and Singapore, has deployed Juniper’s Metro Fabric solutions to support its global network upgrades to power future IoT applications and robust enterprise services. Epsilon combines on-demand infrastructure, automation, web-based portals and APIs to deliver "friction-free access to global connectivity for resolving complex networking challenges." Its "Infiny by Epsilon" connectivity is based on a self-service SDN platform. 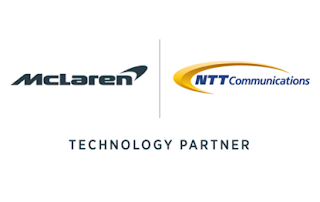 The current network is a terabit optical global backbone, which is deployed across over 90 Points of Presence (PoP) globally and connects over 600 network operators, communication and cloud service providers. For this upgrade project, Epsilon required seamless integration with their existing network for optimized network management and the ability to quickly scale for service expansion and speed of delivery. These requirements will also enable end-to-end service level agreement (SLA) visibility, a key differentiator that will support web-based on-demand provisioning. 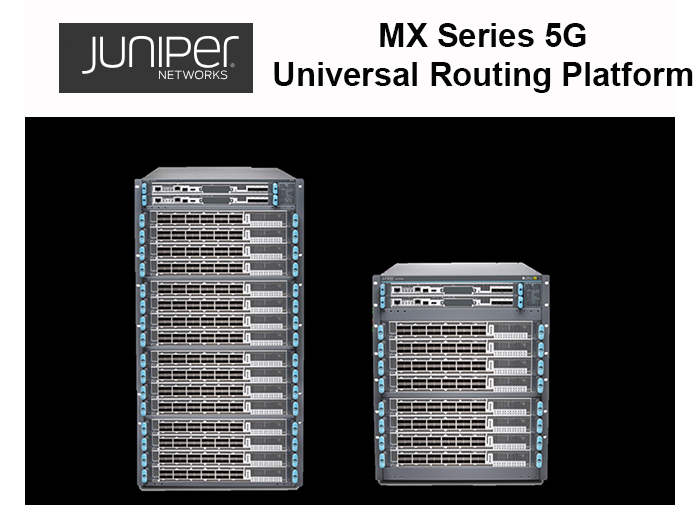 100GbE-readiness with flexibility in the underlay: uses a combination of the MX10003 5G Universal Routing Platform as the MPLS transport core, and Metro Fabric solutions from Juniper consisting of the ACX5048 Universal Metro Router and BTI Packet Optical Transport Platforms. This enables a variety of connectivity options across 1GbE/10GbE/100GbE, tailored to individual market requirements. Interoperability, automation and a single-pane-of-management: Across the stack, network management is now significantly streamlined, while offering end-to-end visibility and increased automation capabilities. Leverages interoperability of Juniper’s solutions and the open APIs provided by the Junos operating system. 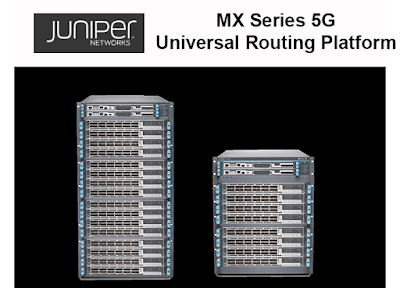 Forward-looking scalability to support IoT and big data applications: leverages continued upgrades of the MX Series 5G Universal Routing Platform and ACX Series Universal Metro Routers, offering the current and long-term scalability and investment protection required to service more than 100 points-of-presence across the United States, Europe, Middle East and Asia-Pacific. “We have been evolving our infrastructure gradually over the last decade in anticipation for the massive traffic growth driven by innovations in cloud, big data and IoT. By upgrading our network to offer 100GbE on-demand around the world, we are helping not only our existing partners but also new customers to benefit from hyper-scalable connectivity that is designed to support services of the future. We are pleased to partner with Juniper to realize our vision for flexible, fluid and intelligent global networking,” stated Jerzy Szlosarek, chief executive officer, Epsilon. “The exponentially growing demands of today’s and tomorrow’s networking traffic is a continuously-evolving challenge for our customers. As we continue to address these and other networking complexities, we are proud to have found an outstanding long-term partner in Epsilon. Their rapidly growing global platforms demand a stellar foundation of powerful and reliable network infrastructure solutions that are adaptable to future requirements – and we are delighted to continue providing them with the critical technology differentiators crucial for their continued growth and success in the long-term,” said Sally Bament, vice president, service provider marketing, Juniper Networks. Apple, AWS and SuperMicro all issued statements strongly refuting the article. Super Micro: "Supermicro has never found any malicious chips, nor been informed by any customer that such chips have been found... Supermicro has never been contacted by any government agencies either domestic or foreign regarding the alleged claims." 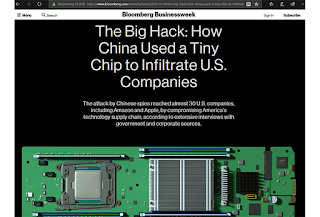 AWS, Steve Schmidt, Chief Information Security Officer: "As we shared with Bloomberg BusinessWeek multiple times over the last couple months, at no time, past or present, have we ever found any issues relating to modified hardware or malicious chips in Supermicro motherboards in any Elemental or Amazon systems.‎"
Bloomberg said it was confident in its reporting and had multiple sources to verify the attack. 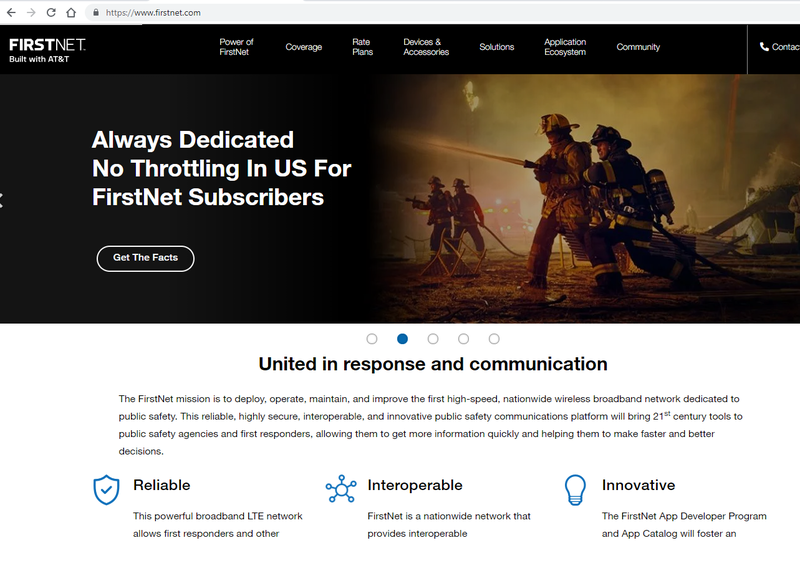 FirstNet is building a fleet of network assets, including Satellite Cell on Light Trucks (SatCOLTs), that public safety agencies subscribing to FirstNet can call upon during emergencies to help first responders stay connected. The fleet now includes 72 dedicated deployable network assets that are stationed across the country. In addition to the FirstNet-dedicated fleet, public safety subscribers will be able to tap into assets, as available, from the AT&T fleet – which is one of the nation’s largest and most advanced disaster response programs. 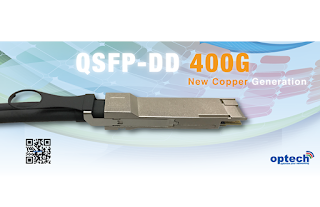 The QSFP-DD transceivers can reach 100 meters for the QSFP-DD SR8 up to 10km for the QSFP-DD LR4. Earlier this year, Optech launched a 100G QSFP28 ER4 Lite transceiver rate for up to 30km. Worldwide spending on security-related hardware, software, and services is forecast to reach $133.7 billion in 2022, according to an new update to IDC's Worldwide Semiannual Security Spending Guide, amounting to a compound annual growth rate (CAGR) of 9.9%. Security spending is forecasted to be $92.1 billion for 2018. "Security remains an investment priority in every industry as companies seek to protect themselves from large-scale cyber attacks and to meet expanding regulatory requirements," said Eileen Smith, program director, Customer Insights and Analysis. "While security services are an important part of this investment strategy, companies are also investing in the infrastructure and applications needed to meet the challenges of a steadily evolving threat environment." Endpoint security software will be the largest software segment throughout the forecast period, followed by identity and access management software and security and vulnerability management software. The latter will be the fastest growing software segment with a CAGR of 10.7%. Hardware spending will be led by unified threat management solutions, followed by firewall and content management. Security-related services, led by managed security services, will account for more than half of the industry's spend throughout the forecast. The second and third largest industries, discrete manufacturing and federal/central government ($8.9 billion and $7.8 billion in 2018, respectively), will follow a similar pattern with services representing roughly half of each industry's total spending. The industries that will see the fastest growth in security spending will be telecommunications (13.1% CAGR), state/local government (12.3% CAGR), and the resource industry (11.8% CAGR). 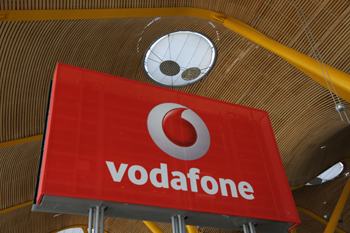 Vodafone Italy announced that the 3700 MHz spectrum it acquired this week in the national auction can be used immediately to enhance coverage, improve capacity, and for the rapid development of 5G services. When it is available from 2022, the 700 MHz spectrum will be used to deploy enhanced 5G services, providing nationwide coverage at very high speed and very low latency. Vodafone can also use the 26 GHz spectrum acquired to deliver high capacity services in densely populated locations such as city centres, sports stadiums or industrial plants. Vodafone currently has 5G trials underway in Milan and its metropolitan area, with the aim of transforming Milan into the 5G capital of Europe. Vodafone expects to have already achieved coverage of 80% of Milan and its metropolitan area by December 2018.